Tooth staining and discoloration can occur for many reasons; many of which are completely out of your control. For instance, you are programmed with a genetic predisposition for many characteristics and traits. One of those is actually the color of your teeth, which typically has an undertone of yellow, brown or gray. As you go through the normal aging process, this shading becomes more pronounced as your enamel tends to naturally thin. This is one reason for tooth discoloration that you simply cannot control. Another common cause for a less than perfectly white smile is the foods and beverages you eat every day. Think about what you may eat and drink regularly. The day may start with coffee, tea or cranberry juice—all of which are prime culprits for staining teeth. Then, lunch may include spaghetti and tomato sauce or perhaps sushi and soy sauce. If you’re going out to dinner, then perhaps you’d like to order a glass of red wine. Over the years, all of these stain-causing ingredients take a toll on the color of your smile. Finally, tooth injuries small and large can be a factor in the discoloration of teeth as well. Micro-cracks in tooth enamel can trap particles of food that stain your teeth. Likewise, fractures and even teeth grinding and clenching can lead to discoloration, too. Fortunately, there is something you can do to reverse the yellowing trend so your smile can look white and bright once again. To successfully combat your tooth discoloration problems and achieve a dazzling, healthier-looking smile, we utilizes state-of-the-art science to whiten your teeth at the molecular level. The system keeps the active ingredients separated until they are applied to your teeth. In this way, you can be sure you’re always getting full-strength whitening. With other systems, especially those offered over-the-counter, you never know if the ingredients are stale. We offer both in-office teeth whitening for patients seeking fast and dramatic changes and take-home teeth whitening kits for those who prefer to improve their smile incrementally. We’ll give you custom-fitted mouth trays and a professional grade bleaching solution. Just fill the trays and wear them according to the instructions provided. You’ll see your smile begin to whiten right away, but the most exciting change will occur after two weeks of use. Whether you prefer our in-office whitening service or the take-home kit, our experienced team will be more than happy to discuss your whitening options so that you can select the method best suited to your preferences, lifestyle, and schedule. 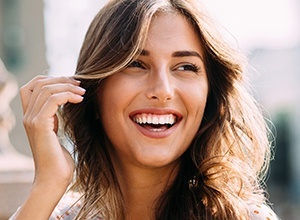 If you want reliable whitening results, contact us today at the Meriden Dental Group for the comprehensive teeth whitening treatment you deserve.